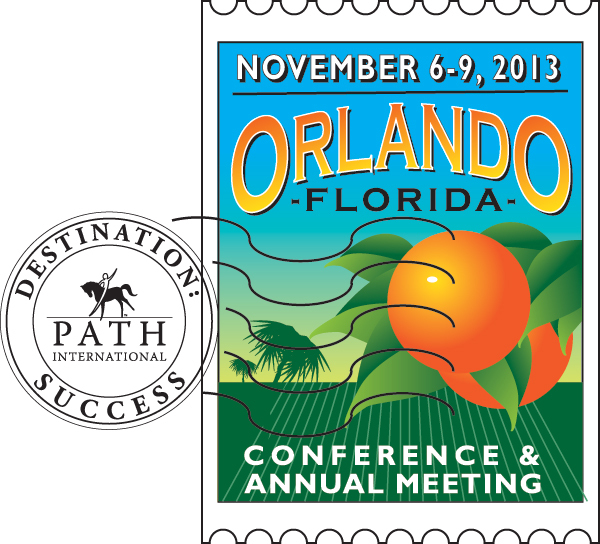 The 2013 PATH Intl. Conference and Annual Meeting page has detailed information on the great Orlando, FL, location and links to possible fun-in-the-sun activities in the area. Information about the conference site and hotel, the Caribe Royale, has been updated. Deadline: March 29, 2013, 11:59 p.m., MDT. Demonstrate to employers and participants' families that you have the ability to step into any instruction situation in the field of EAAT and manage effectively. Apply for your PATH Intl. Master Certification! A volunteer team of advanced and master instructors have recently updated and completed the Master Certification Application booklet. Some of the revisions include an updated process map to clearly lead candidates through the certification activities and deadlines, an updated timeline for the 2013 certification, samples of case study submissions and a timeline for communication with the examining panel. PATH Intl. Master Instructors have a strong background in horsemanship, teaching and a thorough knowledge of a variety of physical, cognitive and emotional disabilities and their relationship to therapeutic riding and other EAAT. They are also qualified to train other therapeutic riding instructors to the advanced level. PATH Intl. Master Instructor Certification is designed for all instructors who wish to be recognized at the highest level of their profession. To learn of prerequisites, qualifications and fees for master instructor certification, click here. For the 2013 cycle only, an Intent to Apply form and application fee are due April 1st. The remaining deadline dates depicted in the flow chart will remain in effect. For the 2014 cycle, the Intent to Apply deadline will return to February 15. If you have any questions, please contact Denise Fager. Sandy Webster, PATH Intl. Master Instructor and Lead Evaluator, will be giving an evaluator update webinar for those evaluators who missed the last one. There is no cost! In this mandatory webinar, Sandy will be presenting the new riding/teaching forms with instruction on how to use them. These will be the only live webinar offerings, so please plan on attending one or the other. If you have questions about what to expect on an accreditation site visit, are unsure how to interpret a specific standard or want to find out how your center can comply with the standards, ask the experts! The PATH Intl. Accreditation Subcommittee and your fellow PATH Intl. Members are on Community Connections to answer your questions. Log in to PATH Intl. Community Connections, join the Standards & Accreditation community and receive expert advice. Most of us have probably heard the old horseman's saying, "no hoof, no horse." Almost every aspect of your equine partner's life will affect his feet, from his conformation to his feed to the surfaces he rests, plays and works on, and, conversely, the condition and health of his feet will affect every aspect of his life. There are numerous problems that can affect your horse's hooves, and this article will list some of the more common ones, and focus on thrush. Future articles will discuss other frequently encountered hoof problems. Read more. Good Things Happening at PATH Intl. Centers! Congratulations to Pony Power Therapies, a PATH Intl. Premier Accredited Center in Mahwah, NJ, which was highlighted on CNN last week as part of a Heroes story. Pony Power Therapies partner with CNN Hero Danielle Gletow, the founder of One Simple Wish to improve the lives of children in foster care, some of which have the added burden of children with disabilities. (Click here for the story and video.) "There is no end to the work that can be done with these amazing animals," said Dana Spett, the executive director of Pony Power Therapies. "Hopefully this will help educate the public further on the benefits of therapeutic riding and equine-assisted activities. What a great industry we have and thank you [PATH Intl.] for keeping the standards so high." Alicia Kershaw, founder and executive director of GallopNYC in Brooklyn, NY, was a guest on the Autism Speaks blog on March 8. Alicia wrote about the benefits of therapeutic horsemanship for those on the autism spectrum. As Alicia reports, "'I didn't know my child could DO that!' is the most frequent comment we hear from parents and teachers watching our riders. It's one of the many ways we know that Therapeutic Horsemanship really works." The Therapeutic Equestrian Center, Inc., in Cold Spring, NY, will be honored on March 21, 2013, at the Cold Spring Area Chamber of Commerce Annual Awards Dinner as Non-Profit Business of the Year for "demonstrating outstanding contributions to the community." Congratulations, TEC! The J.F. Shea Therapeutic Riding Center, a PATH Intl. Premier Accredited Center in San Juan Capistrano, CA, was featured on the NBC4 News, with a story about a girl with cerebral palsy and her progress--including first steps--because of therapeutic horsemanship at the Shea Center. Maddie Fragner's parents turned to a therapeutic riding center in San Juan Capistrano in a desperate attempt to treat the little girl's cerebral palsy. Click here to watch the report. Center membership renewals are due by March 31, 2013. After that, memberships will expire and you will lose your original join date; if you want to continue being a PATH Intl. member after the expiration date, you will need to re-join. As a reminder, center renewals were due December 31, 2012. Centers renewing between now and March 31, 2013 must include a $50 late fee with their center renewal. The 90-day membership renewal grace period began on January 1, 2013. If you have already renewed your center membership, thank you. who do not renew prior to March 31, 2013.